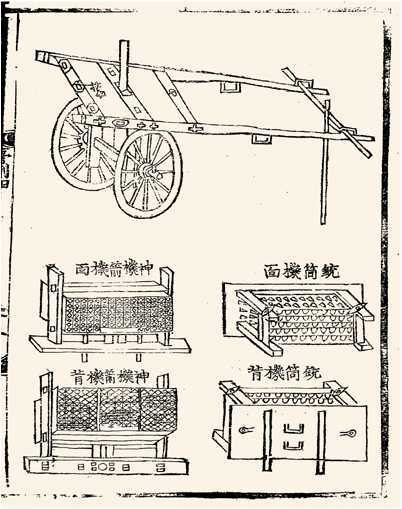 Rocket launchers have had a long history, but it wasn't until WWII that they really began to proliferate. 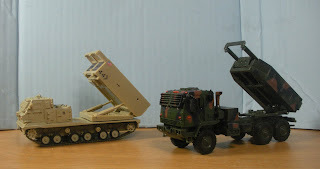 The WWII era rocket launchers are adequately represented in 1/72 with injection kits and some diecast vehicles, but modern rocket launchers remain fairly scarce. I have three types of modern launcher in my collection. All of them are diecast models, and seem to be made by De Agostini (or whoever the manufacturer actually is). The first vehicle is the БМ-30 Смерч (BM-30 Smerch) from the Russian Tank Collection consisting of the 9A52 launch vehicle (MAZ-543M chassis) carrying a dozen 300mm rockets. The cab is diecast metal, but the rest of the parts are plastic, so it feels light for the size of the vehicle. The tires appear to be made of vinyl. The details are a bit soft, but the model seems very sturdy, so I'd have no qualms about using it for gaming. I thought it looked a bit underscale because the doors seemed so small, but in fact, that is how they are in real life. Overall, I was rather disappointed with the model. 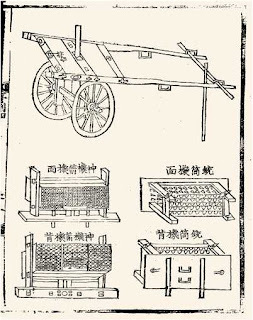 It is one of the more expensive Russian Tank Collection vehicles, but the launch tubes are fixed in place. This vehicle would have been so much more impressive if it could be displayed with the tubes in firing position. 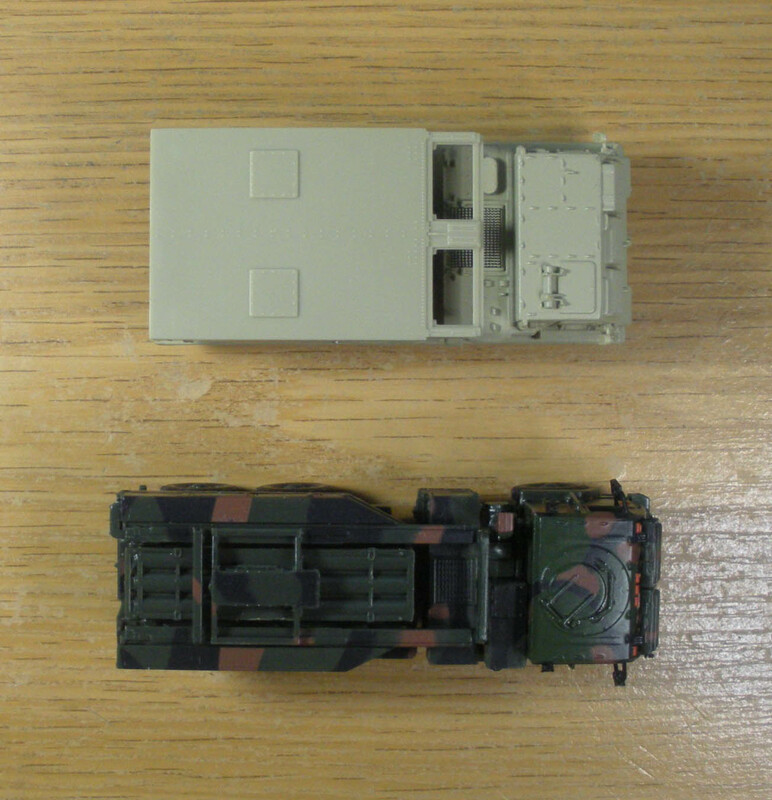 The next two diecast models are from the AmerCom Collection, which seems to be the Polish equivalent of the De Agostini Combat Tank Collection subscription service. 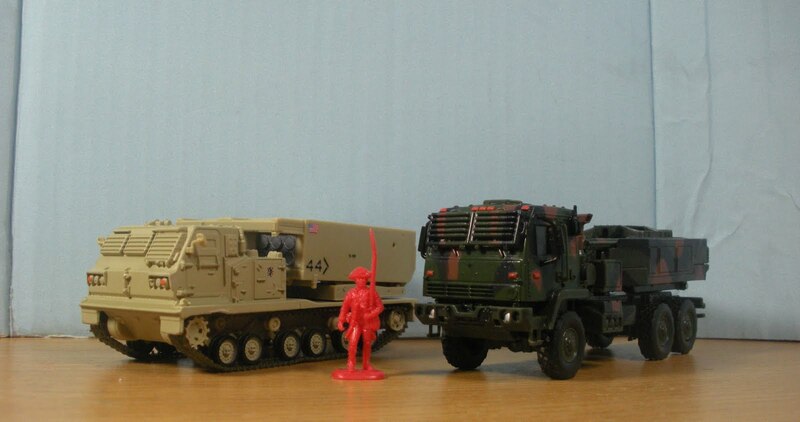 The first vehicle is the M270 Multiple Launch Rocket System consisting of a M269 loader launcher module mounted on a M993 carrier vehicle, while the other is the M142 High Mobility Artillery Rocket System, which is essentially a truck mounted version of the M270 with half the firepower. The M270 has a diecast upper hull which give it a bit of weight, but the launcher module is all plastic. 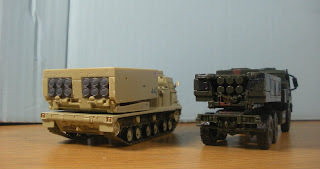 They matched the plastic color very well with the paint for the hull, but the difference in sheen gives the launcher module an obvious plasticky look that detracts from the overall appearance of the vehicle. 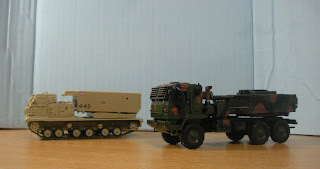 The M142 is mostly plastic, with a diecast cab. The tires are rubber and slightly loose on the hubs. It came covered in greasy fingerprints as if someone was assembling the model over a lunch of fried chicken. The grease came off without any problems using a dry cotton swab. Like the M270, it has a rather plasticky appearance. Unlike the Smerch, the launcher modules for the M270 and M142 can be posed in raised and rotated positions. Overall, I wouldn't say either of these models are bad. They are definitely more suited as display models (their intended use) as opposed to gaming models, though a repaint, or some weathering would definitely improve their looks. The molding is not as soft as the older Altaya models, and some of the small plastic details like the side view mirrors need to be watched out for.